One man at the time who did not turn a blind eye to the atrocity was Mehmet Celal Bey, a Turkish official who is known in some circles as the Ottoman Oskar Schindler. 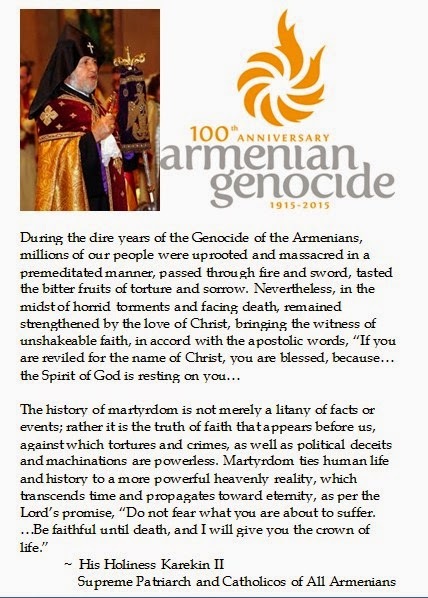 The Armenian Supreme Patriarch Kerekin II canonized the 1.5 million victims of the Armenian Genocide as martyrs. Even today, the topic of the Armenian Genocide inspires tumult and vigorous denials from Turks. Pope Francis stated: The first genocide of the 20th century was that of the Armenians." The Turkish Foreign Ministry immediately shot back that Pope Francis' remarks were one-sided. When that demarche proved insufficient, Ankara summoned the Vatican ambassador for an explanation and later recalled Turkey's Ambassador to Rome. The Turkish Foreign Minister Mevlut Cavusoglu noted: "Religious authorities are not the places to incite resentment and hatred with baseless allegations." Turkey's position is that the 1.5 million victim figure is disputable and that any deaths were due to World War I. Even after 100 years, denial is not just a river in Egypt. The Centennary of the Armenian Genocide is instructive as the world currently is seeing a massacre of Christians by Muslim extremists, like ISIS, Boko Haraam and Al Shabaab, and much of the so called civilized world is non-plussed by the atrocity and believes that it does not affect them. Or our feckless leaders acknowledge the horrific event but never name the perpetrators (radical Islamism) or do not acknowledge the identity of the victims (Christians or Jews).